Call A 1-800 Number And Wait: Migrant Parents Search For Their Children The government is telling parents looking for their children to dial a 1-800 number. One legal coordinator says in her experience, parents aren't getting information for four or five days. A Department of Homeland Security bus pulled up outside Annunciation House, a shelter for migrants and refugees in El Paso, Texas, on Sunday. Parents filed off and walked into the shelter, some exposing their GPS ankle monitors. The parents — about 30 in total — did not speak with the media. Many were released from the county jail, after criminal charges against them for illegal entry were withdrawn. They're ready to reunite with their children, but it's not clear how that's going to happen. Ruben Garcia, the executive director of Annunciation House, said he asked whether the parents "were going to be provided with any specific information on how they go about [getting back] their children" and was told "that the only thing that they're going to be provided is the 1-800 number," he says. Right now, the government is telling parents in search of their children to dial an 800 number. But Taylor Levy, the legal coordinator at the shelter, says in her experience, parents don't get information right away. "They take information from you and they say, 'You can call back when we have more information,' " she says. "It's gonna be four to five days, is what we're hearing right now." 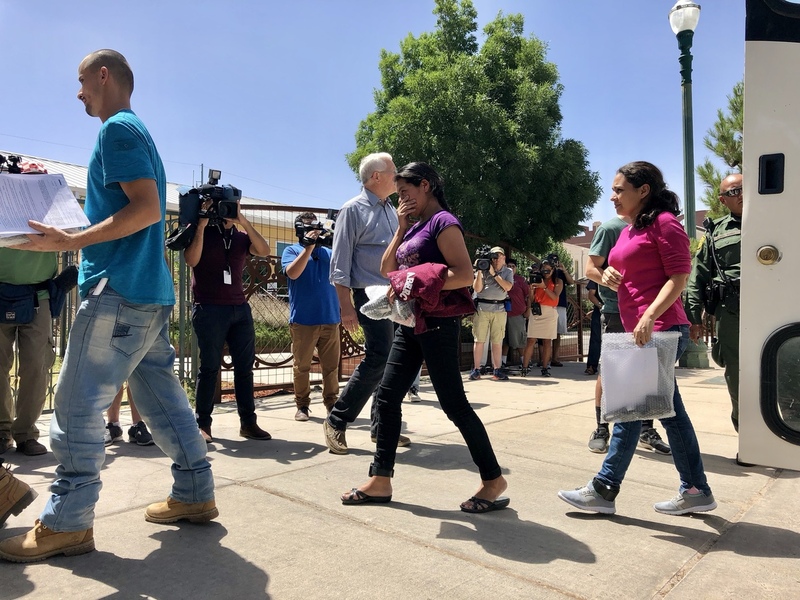 The government says it now has a process for reunifying families and that is has reunited more than 500 children with their parents. But those were children in Customs and Border Protection custody. They hadn't yet been sent to faraway shelters. And that still leaves hundreds of parents with little information about their children. "When you get arrested, for example by Border Patrol, they give you a receipt with everything they took from you," Levy says. "It'll say your rosary, your ID, your $2.50. Everything listed on it. And you sign it, and there's copies and there's receipts. And the parents are given nothing like that for their children when their children are taken from them. But at this point, we don't have any great news about this process being better now." That's part of why protests continue along the border, including about 30 miles outside El Paso in Tornillo, Texas, where hundreds of migrant children are housed in a temporary facility. Julián Castro, the former secretary of housing and urban development, spoke at a rally on Sunday. "We need to verify that these children are being reunited with their parents," Castro told the large crowd. "Keep raising your voice, keep pushing, keep putting pressure on this administration until we see that every single young child that is crying out for their mother or father is reunited with them." The government says it knows where all of those children are housed but hasn't provided a timeline for reunification.